This two-hour scooter tour is a real treat for history buffs. While zooming through San Diego, you’ll learn all about the city’s fascinating past and get a clear picture of just how much has changed! This two-hour scooter tour is a real treat for history buffs. While zooming through San Diego, you’ll learn all about the city’s fascinating past and get a clear picture of just how much has changed over the last century. 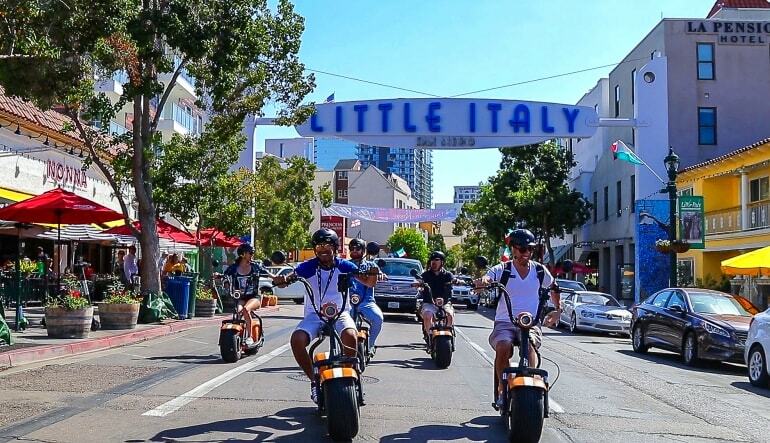 Learn how Little Italy, for instance, transformed from the tuna canning capital of America to the lively hub of art and commerce that it is today. Discover how the Gaslamp Quarter evolved from being Sand Diego’s seedy red-light district to a present-day mecca for good eating and chic boutiques. You’ll learn something new at every turn! And we haven’t even gotten to the best part yet—the scooters! You’ll be riding a Phat Scooter: these modern, fully electric vehicles are designed with wide tires, ensuring the smoothest possible journey. No riding experience or license required—just hop on and go! Your guide comes in the form of a nifty GPS, feeding you engaging history lessons as you encounter each attraction. And because it’s a GPS guided tour, you can take all the detours you want without worrying about getting lost! 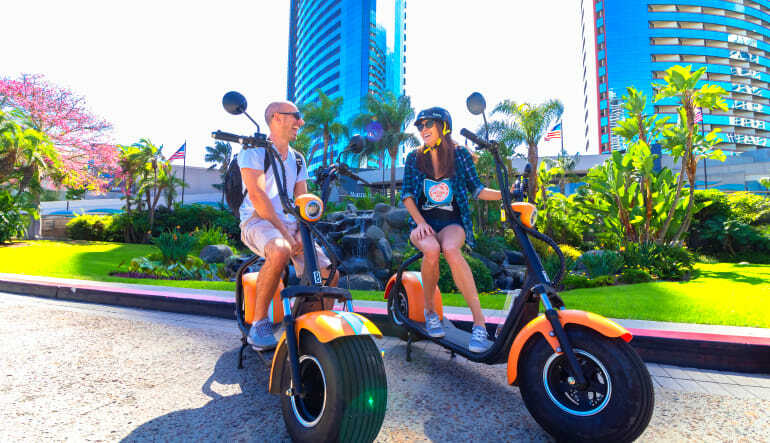 Take a 2 hr Phat Scooter guided San Diego tour! Begin with a quick riding instruction (it’s easier than you think)! Travel along the bay, visualizing the Spanish ships dropping anchor centuries ago! Continue to the Gaslamp Quarter and learn about its drastic transformation. Visit Presidio Park where the old Spanish Mission once stood. Continue into Old Town San Diego. Be inspired by the beautiful architecture. Never take a wrong turn with the help of your friendly (and knowledgeable) GPS guide! 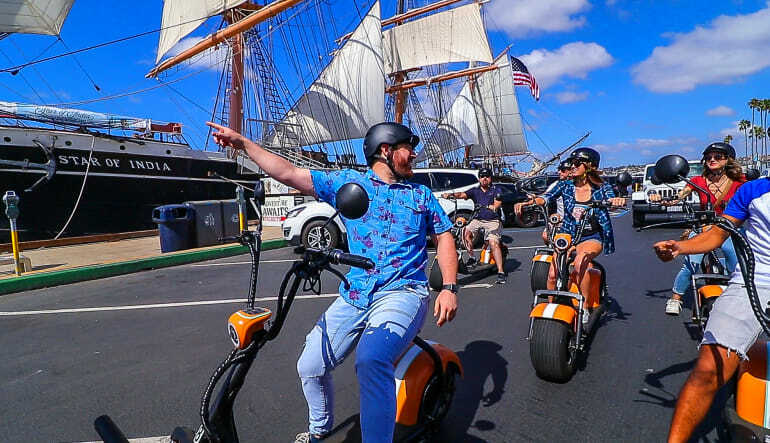 If you’re visiting San Diego, this scooter tour is a must. In just two hours, you’ll be treated to some of the city’s best sights, smells and sounds. And if you’re a local, brush up on your hometown history while enjoying some fresh air—it’s a great way to kill a Sunday afternoon! 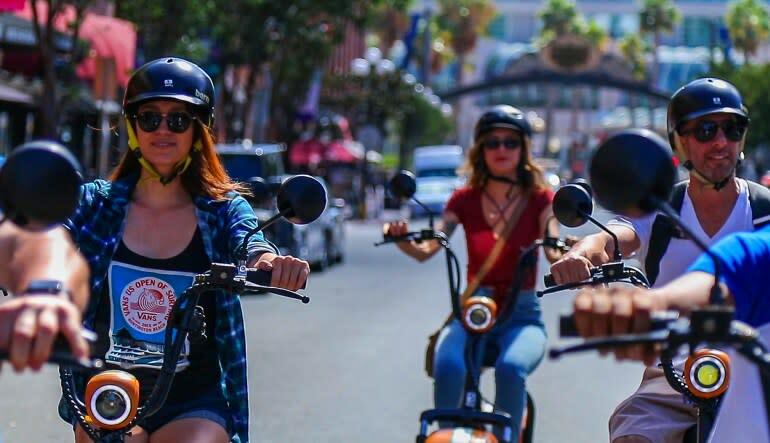 Book this Sand Diego Scooter Tour today! The minimum rider age is 15. If under the age of 18 the rider must be accompanied by and adult. A driver’s license is not required but you must have some form of valid picture ID. Renters are free to extend the length of their tour on the day of rental. Additional rental time will be charged in 15-minute increments. Tours depart daily between 9:00 am and 3:00 pm.